Prior to someone being given the protections of a refugee, they first need to seek asylum. An asylum seeker is an individual outside of their home country who requests protection as a refugee in a new country, due to fear of being harmed or persecuted in their own country. Though the term “refugees” is used colloquially to describe someone who flees their country of origin, it is actually a legal label determined by national and international law. Simply put, a person declares him or herself an asylum seeker, while a government or the United Nations determines that someone is a refugee. 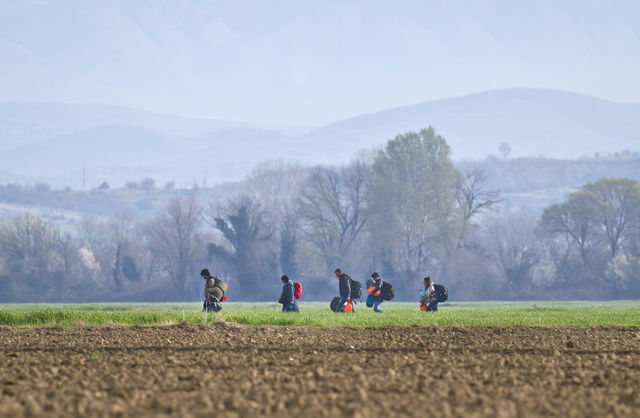 Mainstream media coverage of mass migrations such as the Syrian refugee crisis often gloss over the distinction or incorrectly use the terms interchangeably, muddling national and international asylum laws. Simply labeling any person fleeing a crisis as a refugee is inaccurate, even if that person is escaping extenuating circumstances. Understanding the terms that are used to describe individuals within these groups is important for assessing how they are being treated, and whether states and agencies vested with protecting them are carrying out their responsibilities and preserving the dignity of those applying for asylum. So how does the asylum system work? The United Nations 1951 Convention Relating to the Status of Refugees, as amended by the 1967 Protocol to the convention, is the key international law governing the asylum process and refugee status. It defines a refugee as someone outside their home country who has â€œa well-founded fear of being persecuted for reasons of race, religion, nationality, membership of a particular social group or political opinionâ€ and who is therefore unwilling to return to their country of origin. Regional refugee conventions broaden this definition. The 1969 OAU Convention, which was created to address specific aspects of refugee issues in Africa, and the 1984 Cartagena Declaration, observed in Latin America, expand the 1951 Convention’s rules to recognize people fleeing generalized violence, such as civil war. Because of this, it is much easier for an asylum seeker to be recognized as a refugee under these regional conventions. Recognition under such conventions is often used where there is a mass influx of asylum seekers and the numbers are simply too large to undertake individual refugee status determinations; basically, the group is recognized as a whole. A person may request asylum in any country outside their own; there is no obligation for an individual to claim asylum in the first country they reach. Rather, the “first country of asylum” principle refers to the expectation that countries should accept asylum seekers fleeing their neighboring countries. In the European Union, however, the 2003 Dublin II regulation determines which E.U. member state is obligated to process an asylum claim; if an asylum claim is made within 12 months of arriving in the E.U., the first E.U. country in which the asylum seeker arrived is responsible for processing the claim (after that, it’s the E.U. country where the person has lived for at least five months). In whichever country an asylum seeker is processed, the host country has the primary responsibility to provide international protection. This includes recognizing and providing safe haven to refugees and processing asylum cases in a fair and timely manner. If a government lacks the capacity or willingness to conduct the process itself, the United Nations High Commissioner for Refugees (UNHCR) may do so for that country. When an individual claims asylum, the assessment process, called refugee status determination (RSD), begins. A government official or UNHCR officer interviews the asylum seeker and researches the situation in their country of origin to assess whether their circumstances fit the requirements of any applicable refugee convention. If so, they may be granted refugee status. This means that an authority has recognized them as in need of refuge. An asylum seeker is entitled to stay in the country of asylum and have their claim heard. Host governments cannot force asylum seekers to return to a country where they fear persecution. This key right of asylum seekers under the 1951 Convention, referred to as the principle of non-refoulement, is an important part of customary international law. It is amplified by other human rights conventions, such as the 1966 International Covenant on Civil and Political Rights (ICCPR), which prohibits returning someone to a country where they may be tortured. There are exceptions to the non-refoulement rule, but only in very limited circumstances for example, if an asylum seeker poses a threat to the state or host community. Germany is debating this right now in the wake of New Year’s Eve assaults attributed to foreigners. Under domestic law, an asylum seeker can be deported only if they are convicted of a crime and receive a prison sentence longer than one year; some politicians promote increasing deportations of asylum seekers to their home or a safe third country. Living conditions vary widely depending on the country in which a person requests asylum. In Africa, Asia and the Middle East, many countries have encampment policies. This means that asylum seekers must be relocated to refugee camps to await the decision on their status. In addition, Australia remands asylum seekers to camps but it operates controversial offshore detention centers in Nauru and Papua New Guinea as a deterrent measure in the hope that this will dissuade people from arriving by sea to seek asylum. Despite the non-refoulement principle, a host government may relocate asylum seekers to a safe third country as long as the government continues to perform their hosting duties and conduct the RSD process. In Europe, some countries use immigration detention centers while others house asylum seekers in community centers. Most prohibit asylum seekers from getting a job, or impose waiting periods. In the United Kingdom, asylum seekers are prohibited from working during their first year. In Germany, asylum seekers can work after a three-month waiting period but they can be hired only if no German or E.U. citizen is in the running for the job. In some countries asylum seekers live among local populations, either in cities or rural areas. Refugees with the financial resources to do so may be able to rent houses and live among the host population until they receive a determination on their status. The majority of Syrian asylum seekers in Jordan, Lebanon, Turkey and Iraq do not live in camps, for example. They seek informal work to earn money to rent places to live, build makeshift homes or camps together, and take shelter in abandoned buildings. Who Grants or Denies Asylum Seekersâ€™ Claims? Government or UNHCR officers conduct refugee status determination interviews with asylum applicants to assess their reasons for leaving their countries of origin. Across the developed world, many countries with the capacity to conduct RSDs perform this function through their own government agencies. In some countries, though, governments do not perform this role, leaving it to the UNHCR to assess asylum claims. If the UNHCR conducts the RSD process, the interview is done according to the procedural rules and legal principles outlined in the Handbook and Guidelines on Procedures and Criteria for Determining Refugee Status. In the case of government-conducted RSD interviews, each state follows its own procedural guidelines. Key international and regional conventions to which the government is a signatory such as the 1951 Refugee Convention, 1969 OAU convention and the 1984 Cartagena Declaration ensure that principles are applied in a reasonably similar manner to all asylum applications. The country in which asylum is claimed, as well as the regional political context, also has a significant effect on the process and waiting periods experienced by asylum seekers. The governments of the majority of developed countries directly apply the 1951 Refugee Convention principles due to their accession and ratification of the convention, while others have incorporated the convention’s principles into domestic law. Tanzania, Egypt, the United States and Australia are examples of governments that choose to respond in different ways to asylum claims. In the case of Tanzania, the government conducts RSD procedures. Because Tanzania is a signatory to both the 1951 Refugee Convention and the 1969 OAU Convention, it can choose to recognize an asylum seeker under either of those conventions’ principles and through interpretation of its own domestic law, the Refugees Act, 1998. This domestic legislation incorporates the provisions of the 1951 Refugee Convention. In the past when there have been mass arrivals of asylum seekers for example, following the 1994 Rwandan genocide, the Tanzanian government has chosen to acknowledge most asylum seekers in its territory under the 1969 OAU Convention because it recognizes as a refugee anyone fleeing generalized violence. This is also how Tanzania is currently granting asylum to Burundians fleeing unrest in their country. In Egypt, the government is not involved in determining the status of asylum seekers in its territory. The government does not participate in RSD procedures, leaving that function to the local UNHCR office. Because Egypt is a signatory to both the 1951 Refugee Convention and the 1969 OAU Convention, the UNHCR is authorized to recognize asylum seekers as refugees under either convention. For specific cases, such as Eritrean army deserters, it uses the 1951 Convention. For those coming from countries with widespread violence such as Somalia it uses the 1969 Convention, due to its broader definition that includes those fleeing generalized violence. Instead of viewing international law as overriding domestic law, some countries treat the two as operating in parallel. When countries like this join and ratify an international convention, that convention does not necessarily become the main law in that country. To be observed, the principles in the convention must be incorporated through an act of domestic legislation. For example, Australia is a signatory to the 1951 Convention, but the provisions of the convention have effect only through amendments to the 1958 Migration Act. The United States has a similar approach with its 1952 Immigration and Nationality Act. When these countries assess an asylum claim, they are doing so under their own domestic laws. It is worth noting that if the government of a country that hosts a UNHCR operation rejects the claim of an asylum seeker, the UNHCR can recognize that asylum seeker as a refugee under its mandate. This happens in cases where the UNHCR disagrees with the decision of the government and finds that the individual is at risk of persecution in their own country.